After Airworthiness Inspection and Certification, all seemed going well. We called in the test pilot. We ran into a gliitch that I felt needed further investigation. Also, the pilot asked for a little bit more “cushion” under the throttle stops. 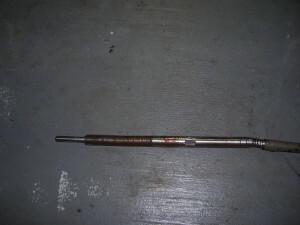 During throttle alignment, we found a tiny bit of play in the torque tubes that could mean a sloppy movement later on. So I elected to take the system out. WHAT A MESS!!!! Jeez! Whoever designed this mechanism is a sadist and a can short of a six pack. Anyway, we got the things out, fixed, and back in. Now time to re-set the throttles. And guess what? We somehow snapped the internal throttle cable. So OUT it came, along with its attendant parts. Now I am trying to find someone who make this cable to specs, and it is not easy. Its an unusual cable system. I think we found a supplier, but will have to see if they can do what we want. Next week will tell the story. Otherwise we have to change to a different cable system, which I don’t want to do. Anyway, it’s still not in the air. I think the test pilot, Steve, is going to shoot me. He wanted it at Lakeland and Oshkosh. Finally, it’s great to know that there are some airplane buffs out there watching this blog. The people who are in Seattle know who I mean. I’m flying out on Alaska Airlines next week for some R and R and visit some family. I promise to put up photos of the bird in its present state later. Hopefully it will be doing some airshows out there soon. “See ya next week Cory”. This entry was posted on Friday, August 5th, 2011 at 4:10 PM	and is filed under N87921 Restoration. You can follow any responses to this entry through the RSS 2.0 feed. You can leave a response, or trackback from your own site.